We are a full service Union Roofing Contractor serving Eastern Massachusetts since 1947. Installing virtually every type of roofing system found in New England. 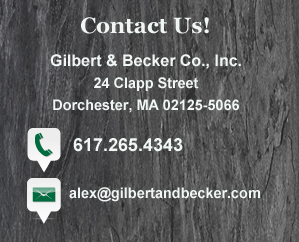 Whether it be a hole in your roof to a whole new roof, Gilbert & Becker can meet your needs. We supply many of the other Boston roofing contractors and plumbers with the supplies they need. We have our own full service sheet metal shop specializing in all aspects of architectural metals including custom fabrication of gutters, downspouts, conductor heads, cornices, cleats, vents, shower pans and anything else to complete your project. We also stock all the necessary materials for your EPDM, TPO, PVC, slate, tile and copper project. If we don’t have it in stock, we can get it. We also offer curbside delivery and rooftop delivery with our 120′ boom truck.